The project he started with is called Relations in Space – Visualization of topological micro structures (German) It is a project working on the visualization of cemeteries including the Jewish cemetery in Hamburg-Altona. The project was funded from 2014 – 2016. It is now winding down. Jewish tombs are not removed over time the way Christian ones are. They are left for eternity. As you walk the cemetery you go through time. The tombs tell us about names, what they did, good times, bad times, and the languages of the dead. The challenge with the Altona cemetery was that there were two different sources of data to be merged. It is the map that does the job of synthesis. It does the magic of gathering information. You can make inferences that you couldn’t from just the data. He showed a simple map of the tombs and then showed variants. He talked about some inferences that can be from the map like why there are a line of womens’ graves when people are supposed to buried in order of death. It could have been an epidemic in the birthing house that killed a number of women at the same time. There were two different databases that came from different groups and were not easily merged. Historians of architecture had gathered information about shapes of tombs and the epigraphists gathered information about inscriptions. For art historians cemeteries are miniature towns that can tell us about sculptural fashions. The art historians had learned XML and oXygen and XSLT and were able to develop technical independence. The text on Jewish tombs is rich and poetic. They have acrostics. Warnke showed the XML for both the sculptural database and the inscriptions. He then talked about data gathering they did on the field to build an accurate map. They used IncScape for vector graphs which works with XML. All the XML was brought in and then merged by a software company. They output merged XML that could be read into HyperImage a tools they have been developing for annotating images and then outputting interactive explorations. HyperImage can be queried. The project is at http://www.uni-lueneburg.de/hyperimage/HI_Altona/ . Here you can see the interface. One of the challenges for the programmers is that the historians constantly change their data. The programmers want stable data. They had to develop a versioning system. Warnke showed the system and talked about the change in perspective from “distant reading” to “close reading” and back. Manovich doesn’t look any more at the single image – he looks only at large numbers. The HyperImage system lets you go in and out. He commented on how when you do real projects you eventually hit the limits of your tools. The HyperImage editing tool ran into trouble with the Altona cemetery. He showed a different cemetery and how you can search the database and map the results. 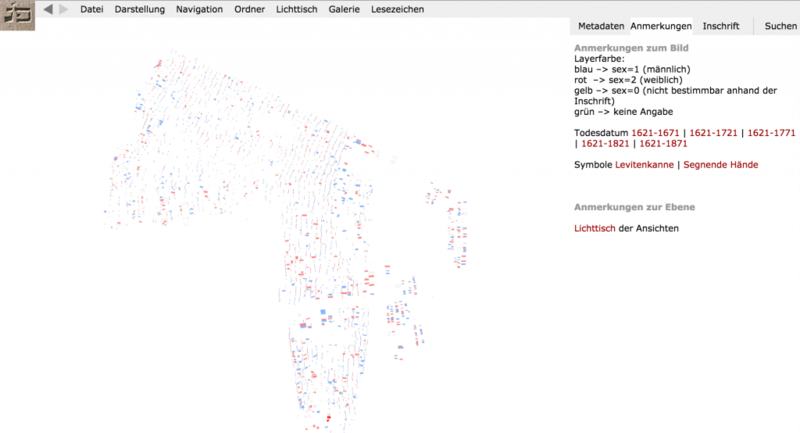 Thus the visualization becomes not just a way to explore the database, but also a way of viewing results. Misery of the business model – One needs to spend time on the business model for projects rather than the project and the research. And, there are no good business models. Misery of infrastructures – Everything has to be redone every 5 years. University computing centres don’t want to maintain individual projects. Big infrastructure projects like Dariah can’t afford to either. Existing projects need to be updated as you are trying to do new ones. He talked about solutions like Prometheus which makes a number of databases available. Misery of funding – At the end all the projects are poorly funded. We are tempted to use commercial systems like Instagram to save our data where commerce maintains things, but that has problems too. He also mentioned the joy of doing all this in an still open field – there is a joy in doing new things. Warnke concluded with some comments on dH in general. DH has a name now, which is a sign of its maturity. It is a scene. But it is also very text centric – what about images, sound, film, and so on. One reason for the field being text centric is a problem with some multimedia like film where one can’t quote a clip the way you can quote a text passage. It is hard to openly address and reference materials other than text and this is the foundation of humanities work. The relationship with CS also varies. In some cases CS is treated as an ancillary science. At the same time CS folk don’t think they can learn anything from the humanities. They don’t think they have any history. They think they can learn what we do quickly. Perhaps they are right – that we wallow in trivial subtleties. He closed on idea of humanists becoming self-enabling. Kittler famously argued one should learn to read code as part of literacy.